Today, I will introduce how to animate 3D models and upload them to STYLY. 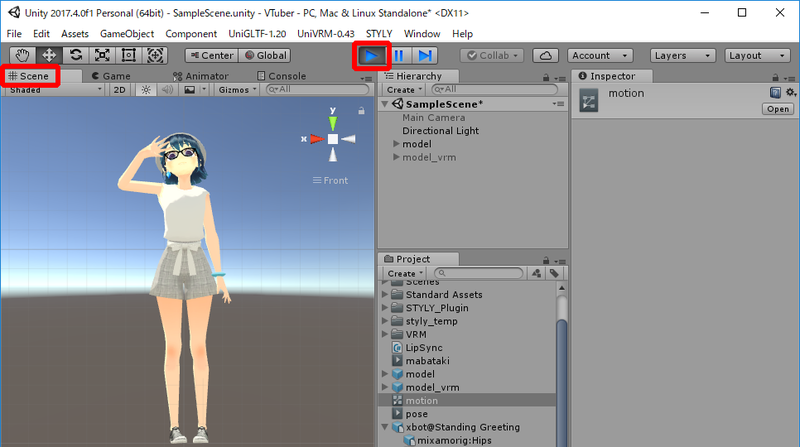 By using STYLY’s Unity plugin, you can keep the material feeling and animations of the model from Unity and upload it easily. You can use this tip for displaying home-made 3D models in VR exhibitions, so I hope you find it useful! 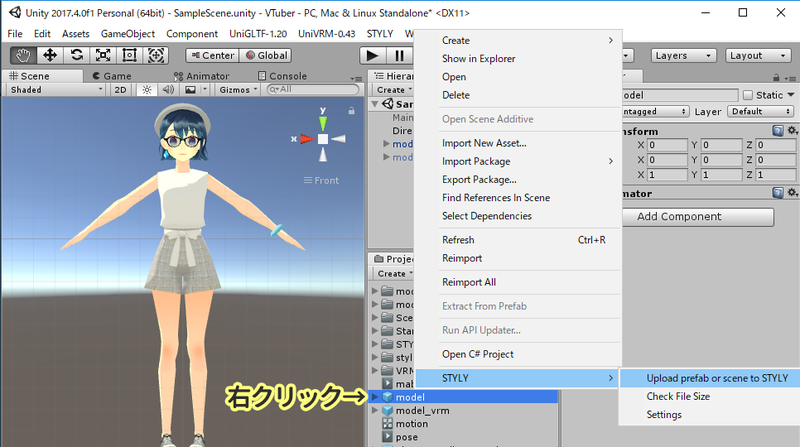 ※ “UNITY PLUGIN FOR STYLY” currently supports “Unity 2017.4.x” or under. You can download old Unity versions from here. Launch Unity and open a new project. 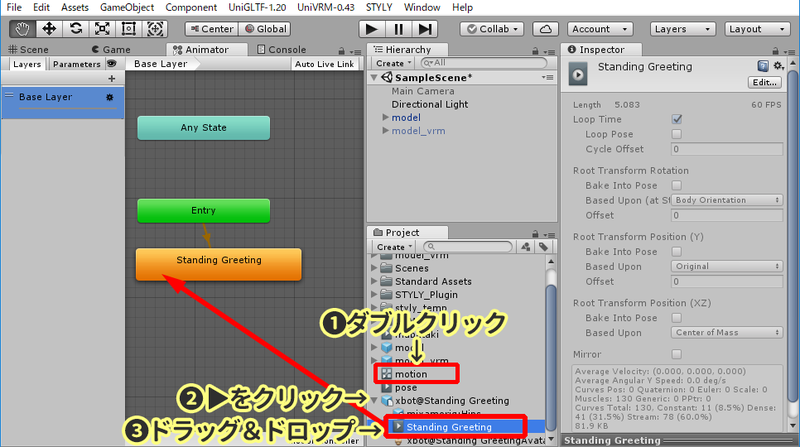 Let’s place the FBX format model data in Unity. Please place the data inside the Assets folder in Project, or drag & drop it into the Project area. In this example, I created a new “model” folder and placed the data in it. 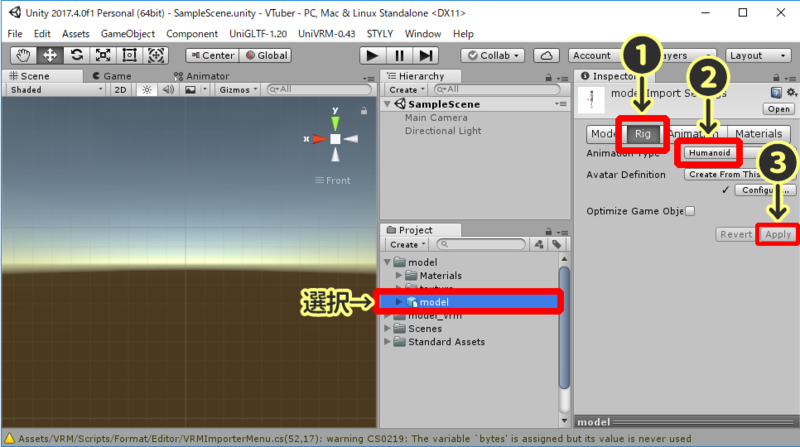 Left click the model data, and select the Inspector tab at the right part of the screen. Click the “Rig” tab, change the Animation Type to “Humanoid”, and click “Apply”. Next, let’s set the material for the 3D model. Change the tab to Materials, and click “Extract Materials…”. A choose folder screen will popup, so create a new folder named Materials, and click “choose folder”. 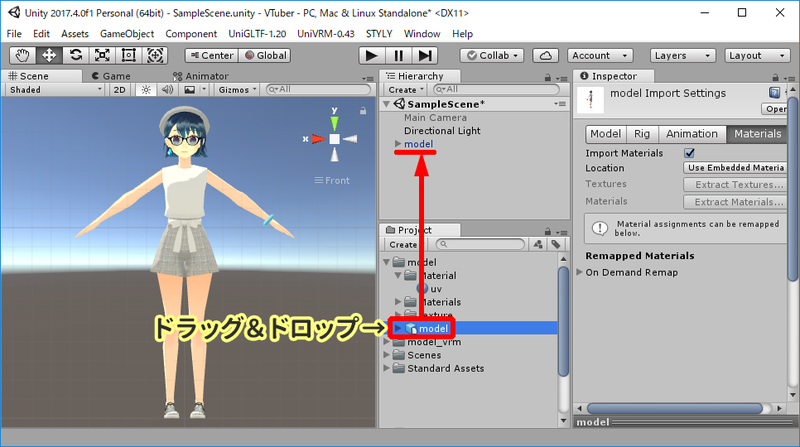 The model’s material will be saved inside the Materials folder, so choose it and set a Shader you like. Drag & drop the model data from the “Project” area to the “Hierarchy” area. If the model has dangling accessories, or scripts like a lip syncing script, right click and select “Remove Component” to delete them. OK, we’re finished with the FBX model’s setting. Click here to move on to how to “set animations”. 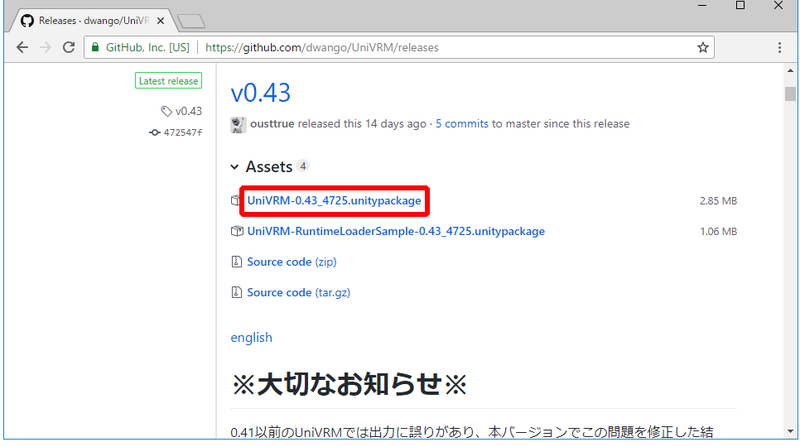 Access the VRM official site download page (https://github.com/dwango/UniVRM/releases) and download the latest version of UniVRM. 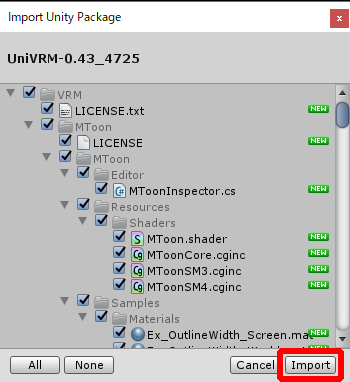 Double click the unitypackage file you downloaded, and import the package to Unity. 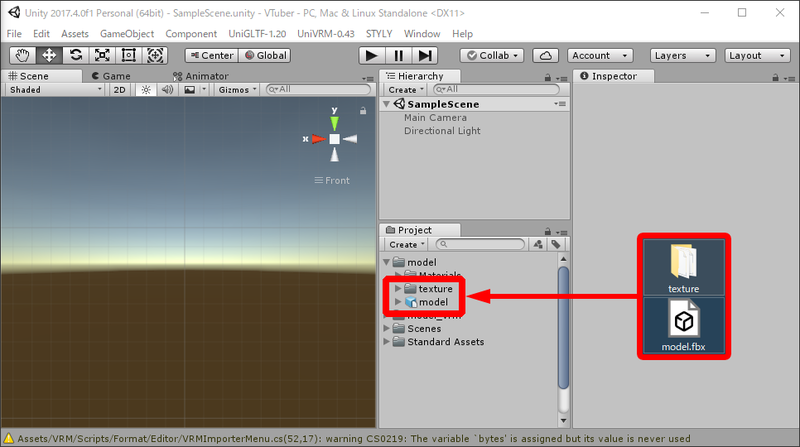 Let’s place the VRM format model data in Unity. 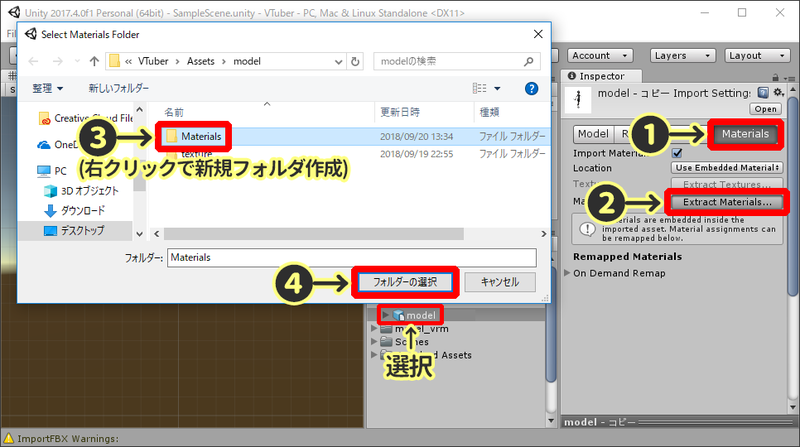 In this example, I created a new “model_vrm” folder and placed the data in it. Once the data is placed in Unity, a Prefab is auto-created. 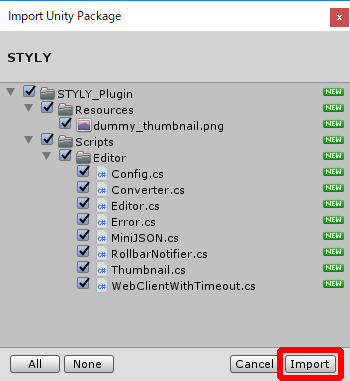 Select the created Prefab, and check the “License” to check if the file is allowed for use in STYLY. The details for the licence is available here. 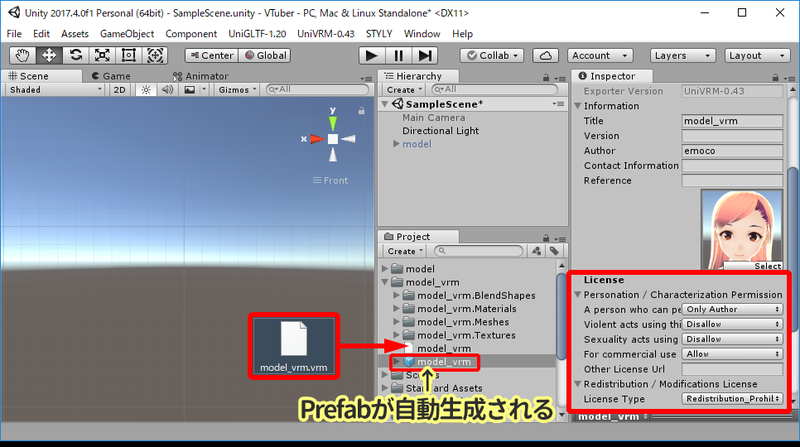 Drag & drop the Prefab file to the Hierarchy area. 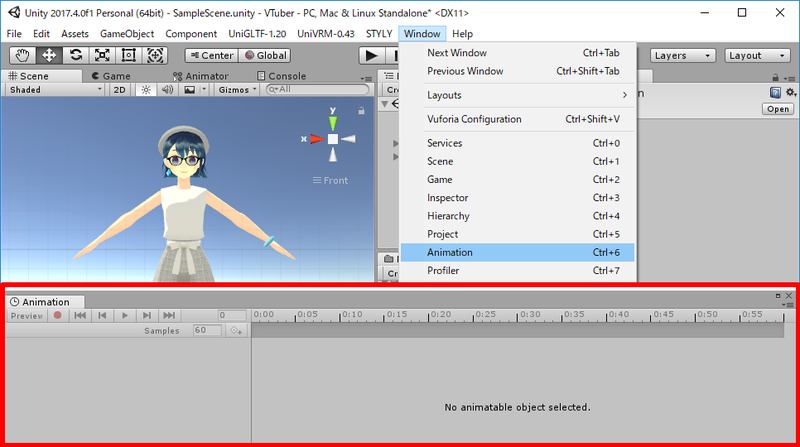 Right click “Remove Component” to delete all scripts except “Animator”. 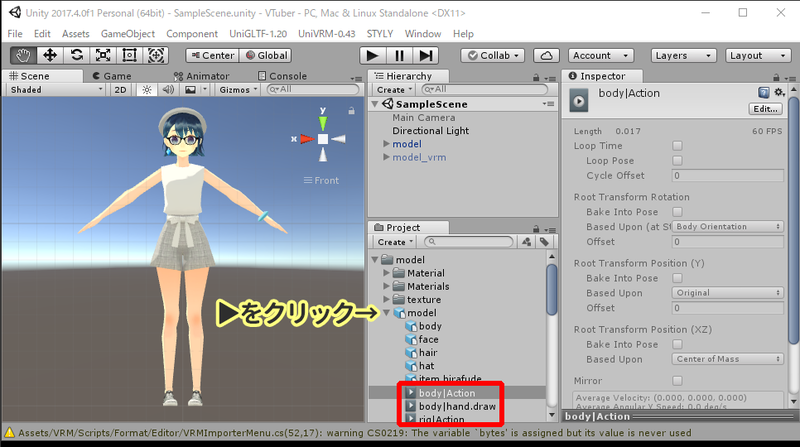 If you are using a VRoid Studio-made VRM model, click “▷” and delete the “secondary” file too. That’s it, we’re finished with the VRM model’s setting. 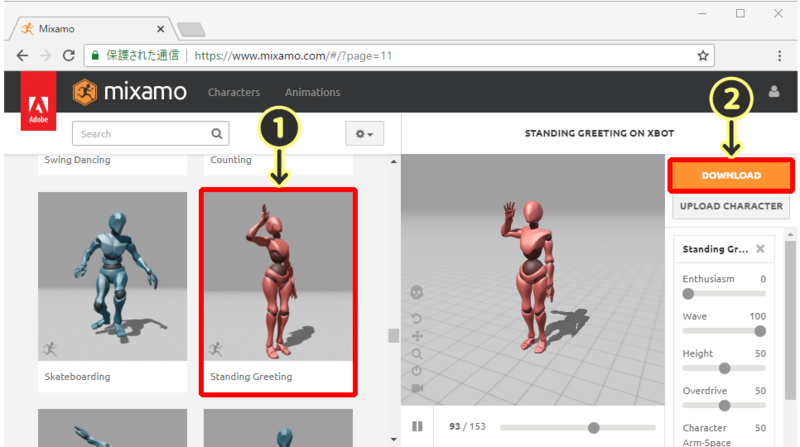 Next, we will use Mixamo to set animations to the 3D model. 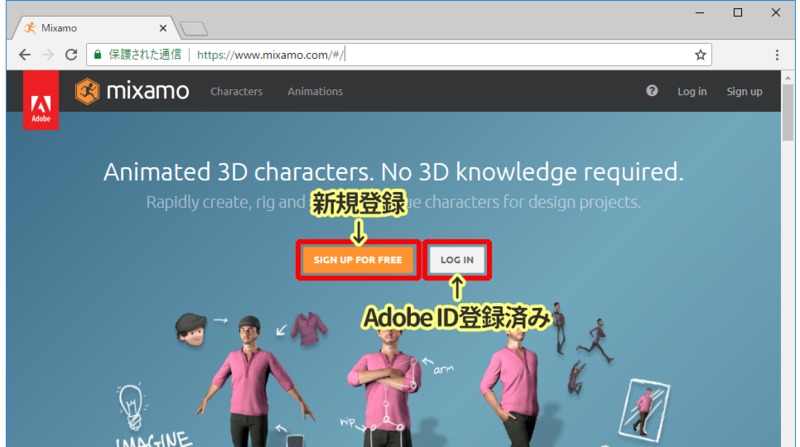 Mixamo is a service from the Adobe company, and there are many motion files and 3D models you can download from the website. Access the Mixamo website (a href=”https://www.mixamo.com” target=”_blank” rel=”noopener”>https://www.mixamo.com), and click “LOG IN” if you already have a Adobe ID, or click “SIGN UP” if you want to register as a new user. When you log in to Mixamo, you will see a list of numerous motions. Search for a motion you prefer, then select it and click “DOWNLOAD”. 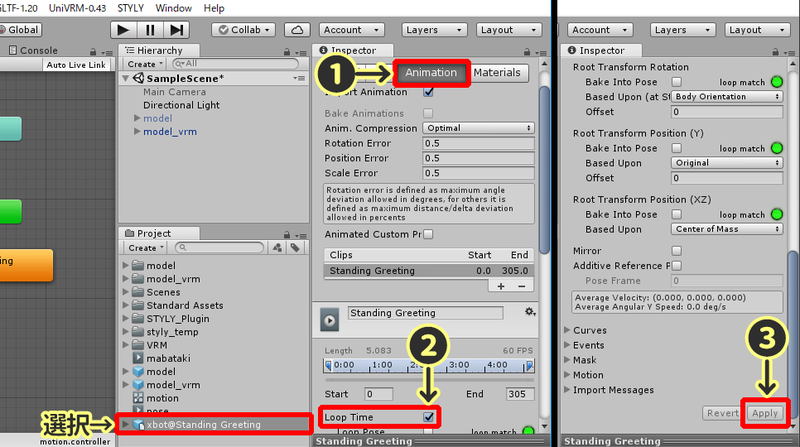 For this example, I changed the download settings as below in order to fit the motion to the model data. 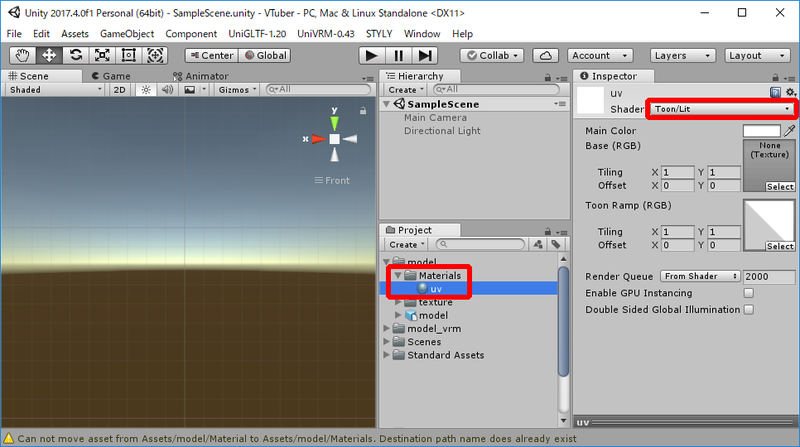 Add the downloaded FBX file to your Unity project. Place the data inside the Assets folder in Project, or drag & drop it into the Project area. 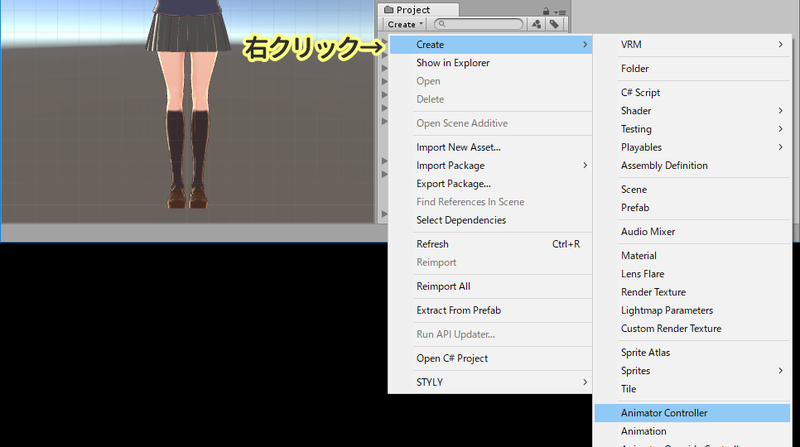 Next, select the added file and choose the “Rig” tab, change the Animation Type to “Humanoid”, and click “Apply”. Then, select the ①”Animation” tab, check ②”Loop Time” and click ③”Apply”. The motion will loop with this setting. 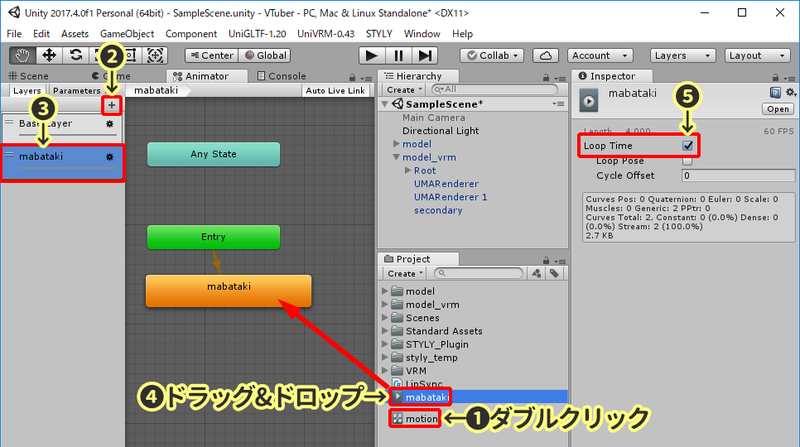 Right click somewhere in the Project area, and create a new “Animator Controller”. I named the controller “motion”. Click the model in the Hierarchy area, and find the Animator section, and for the “Controller”, drag & drop the “motion file” to it. 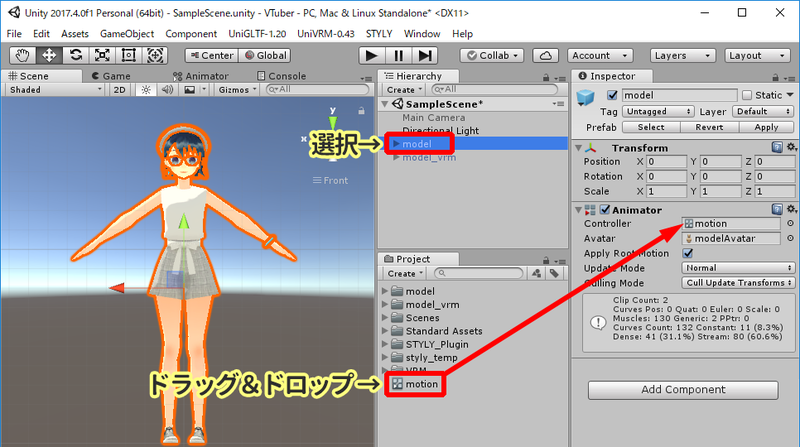 Double click the “motion” (Animator Controller) in the Project area, and show the Animator window. 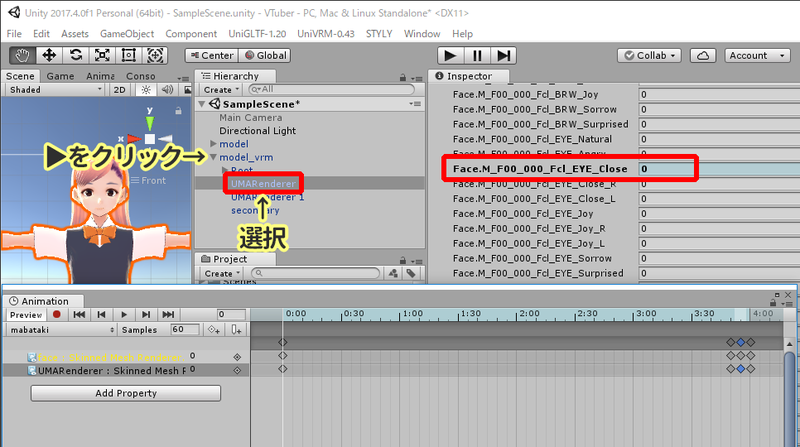 Click the ②「▷」 in the Mixamo FBX file, and drag & drop the “③Play icon” to the Animator area. Finally, lets check if the motion works properly. Select the Scene tab to show the preview, and click the Play icon at the top of the screen. You can also use self-made motions made using software like Blender. 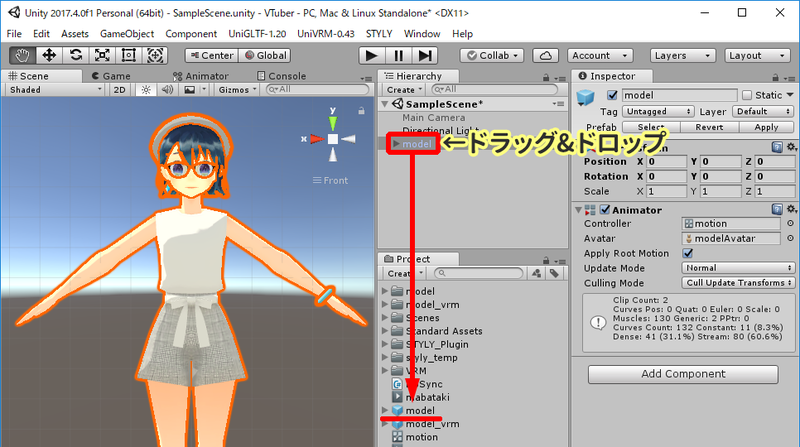 For models that have self-made motions, if you click 「▷」, a “Play icon” will appear. 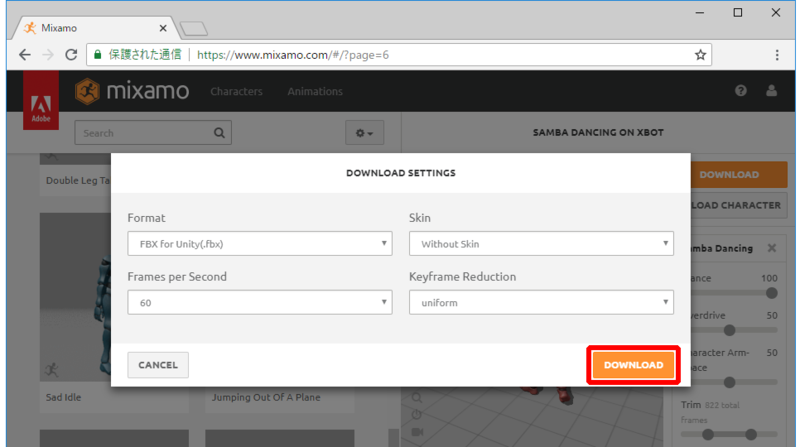 Use this file and perform the same actions as the Mixamo file. If you set “blinking” motions to your character, your character’s sense of presence gets enhanced strongly. 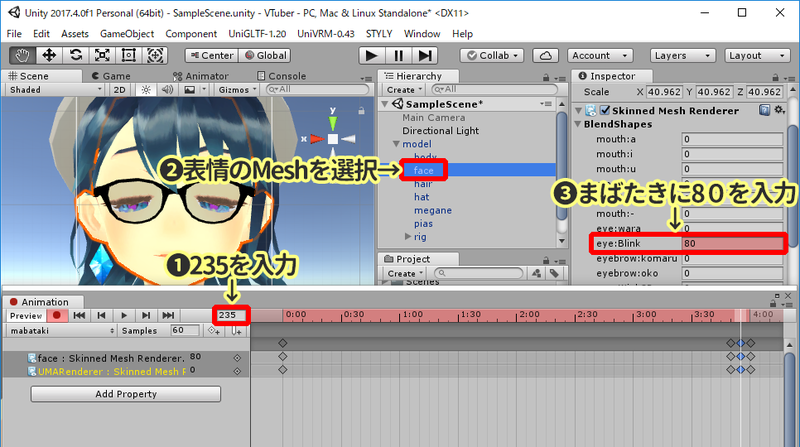 In order to set blinking for your model, a “BlendShape” (this controls the model’s facial expressions) has to be set to the model. 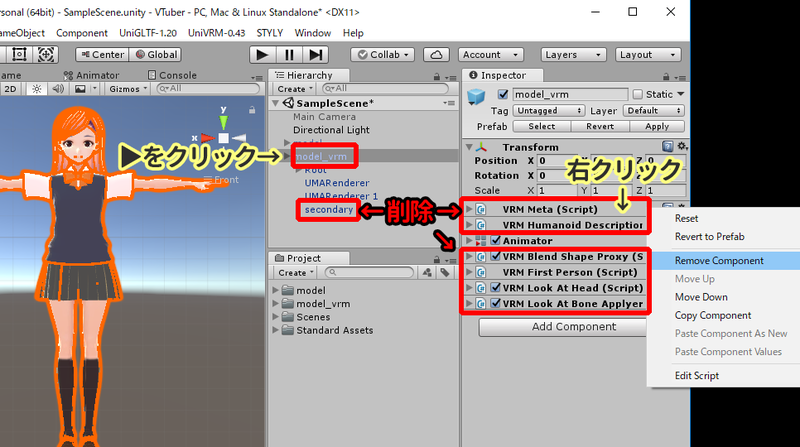 For VRM models, BlendShape are set initially. Click “Window>Animation” and open the Animation window. 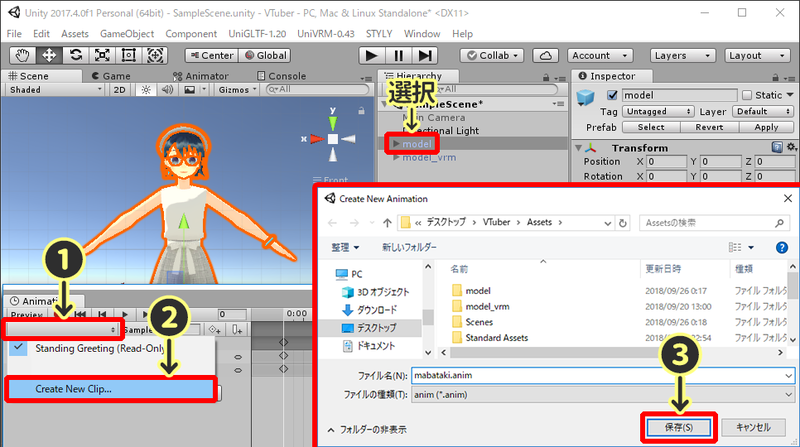 Make sure you have selected the model in the Hierarchy view, and click the ①”Pull down bar”, choose ②”Create New Clip…”, and ③”save” the newly created anim format file. 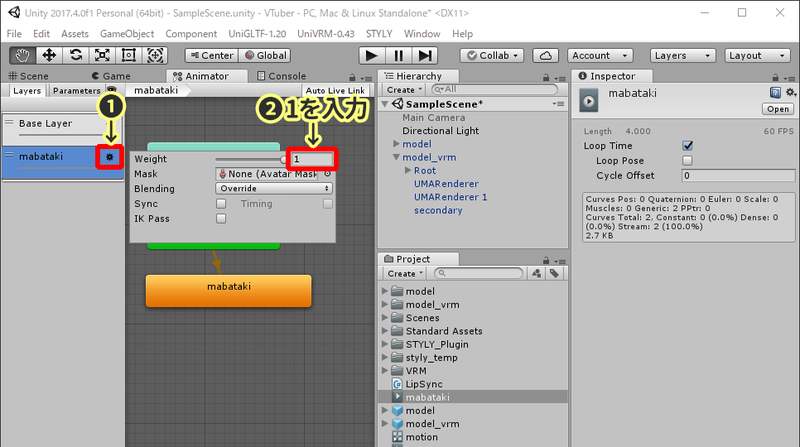 I set the name to “mabataki.anim”. In the Animation window, select “mabataki” and click the ①record icon, enter ②”0″, choose the ③face mesh, and ④Change the blink BlendShape value to 0. When you enter the value, a blue ◆ will appear in the timeline. If no ◆ appears, try changing the ④ to a value other than 0, and changing it to 0 after that. Then, change the ② to “230”, ③ to “0”. Next, change the ② to “235”, ③ to “80”. Finally, change the ② to “240”, ③ to “0”, and click ④Stop record button. 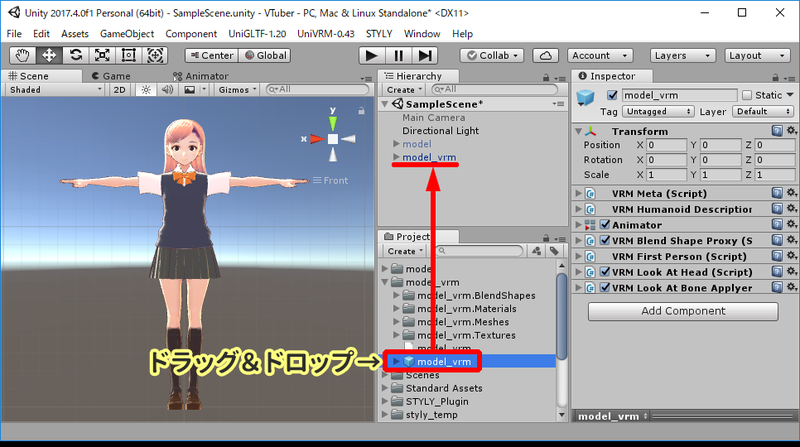 For VRM models made using VRoid Studio, you can find the blink BlendShape in “Face.M_F00_000_Fcl_EYE_Close” of “UMARenderer”. Let’s set the created motion to the model. First, double click ①”motion” and open the Animator window, click the “+” icon, and newly create a “mabataki” layer. Drag & drop the “mabataki” into the layer. 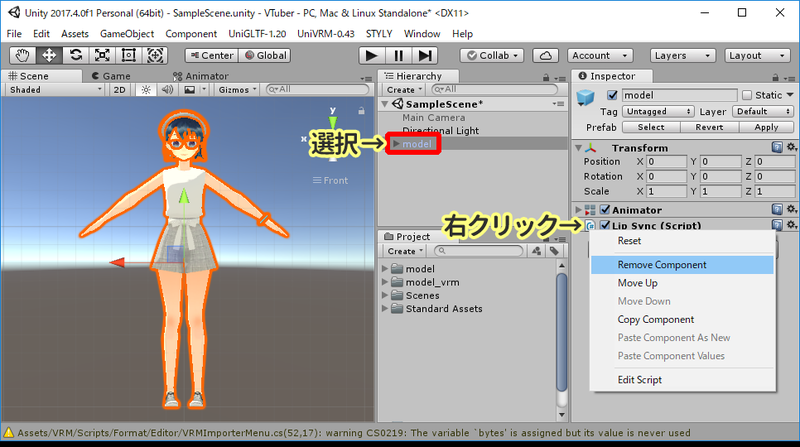 Click the ①”Gear icon”, and change the value of ②「Weight」 to “1”. Finally, let’s check the blinking motion. Select the Scene tab, click the Play button at the top of your screen, and see if the character properly blinks. You can change a different BlendShaper and set different face expressions for your character, so set whatever expression animation you want! So then, lets upload the animated 3D model to STYLY. 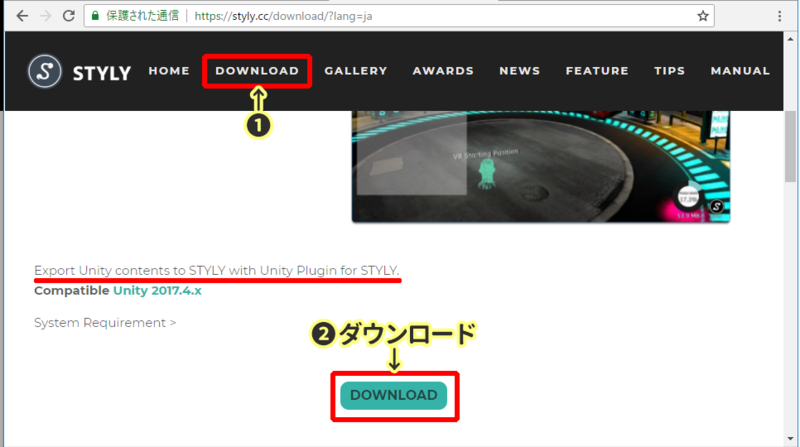 First, access the STYLY official site (https://styly.cc/) and click ①”DOWNLOAD”, then scroll down to the ②DOWNLOAD button and click it. 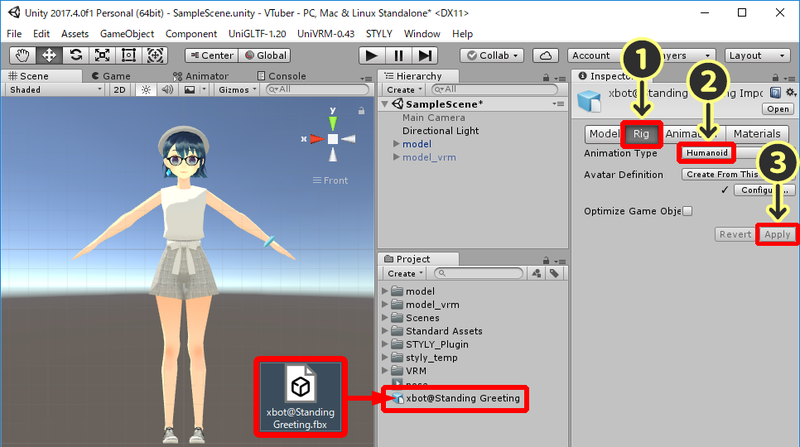 Double click the downloaded unitypackage, and import it to Unity. 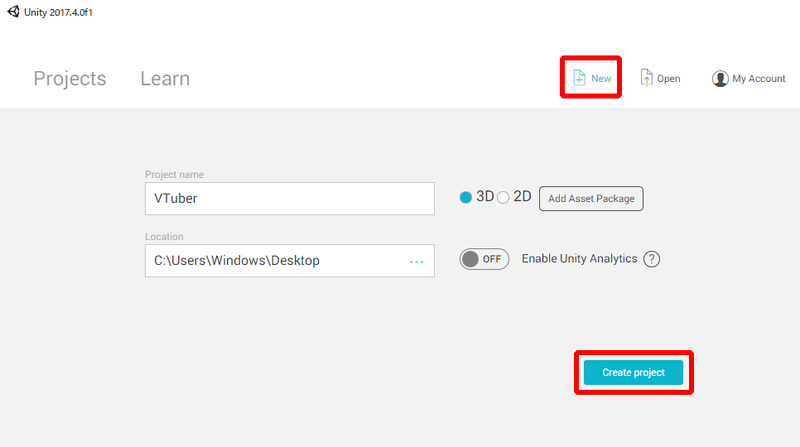 Return to Unity, click the “STYLY>Asset Uploader Settings” at the top of the screen. 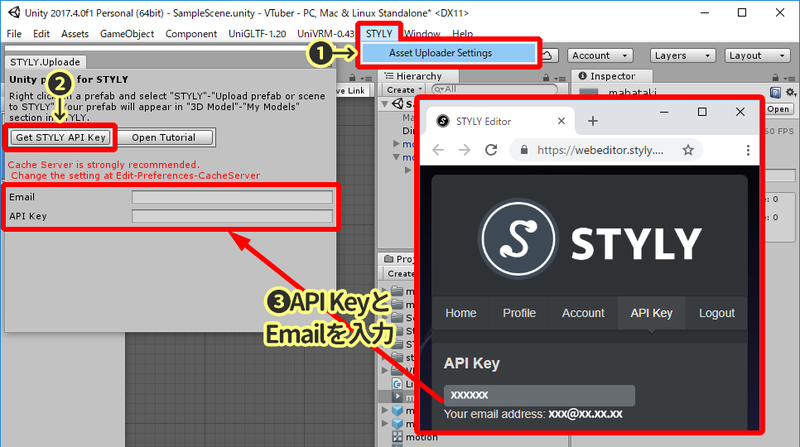 Then click ②”Get STYLY API Key”, and a browser window will pop up, so copy the API key and Email from it, and paste it to the ③window in Unity. 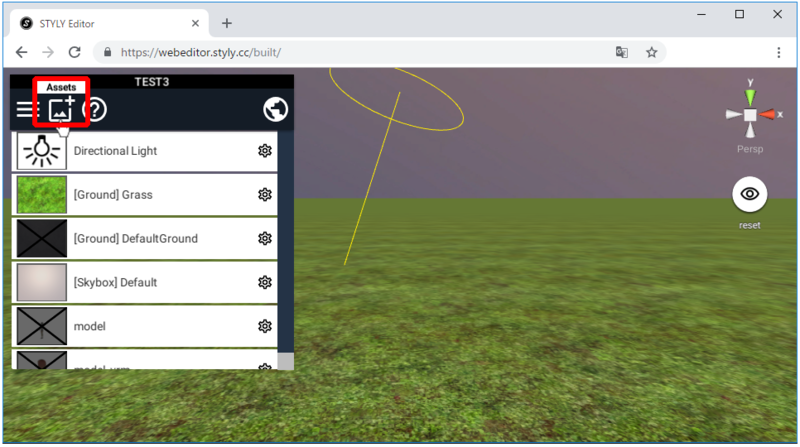 To upload the model to STYLY, you need to create a Prefab from the model. Drag & drop the model from the Hierarchy area to the Project area, and a Prefab will be created in the Project area. Right click the Prefab, and choose “STYLY>Upload Prefab or scene to STYLY”, then the upload process will begin. After some wait, the upload will get completed and the next popup will appear. Let’s place the 3D model you uploaded in STYLY. 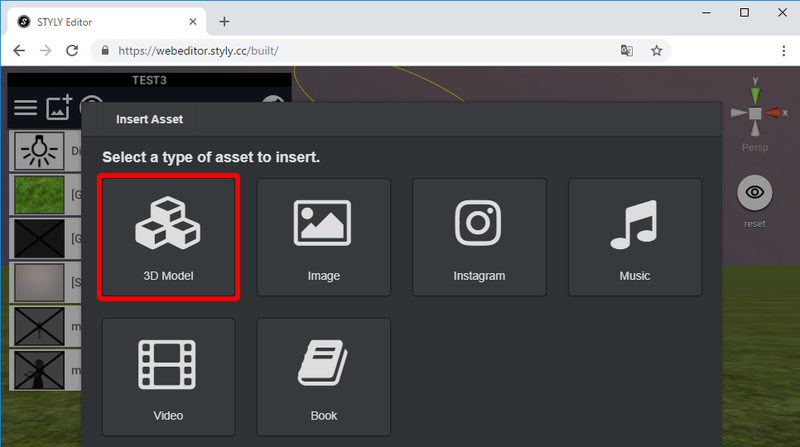 Open the STYLY Editor, and click the “photo icon” at the upper left. Then, click the “3D Model” icon. 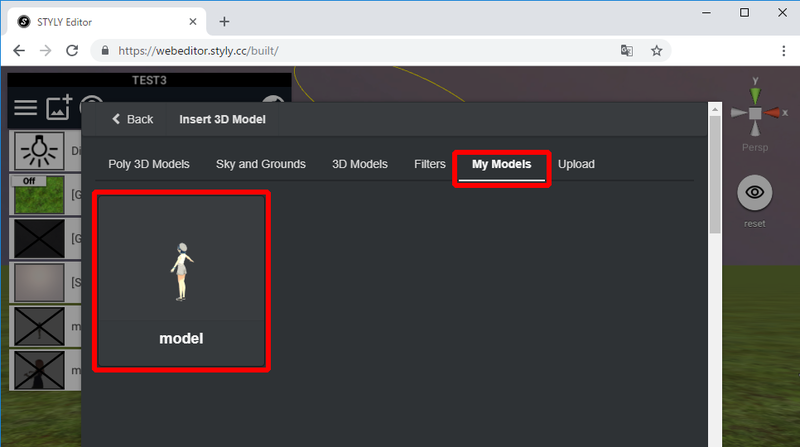 Your model will be uploaded in the “My Models” tab, so click it. The model will be placed inside the scene, so move it to where you want to place it. 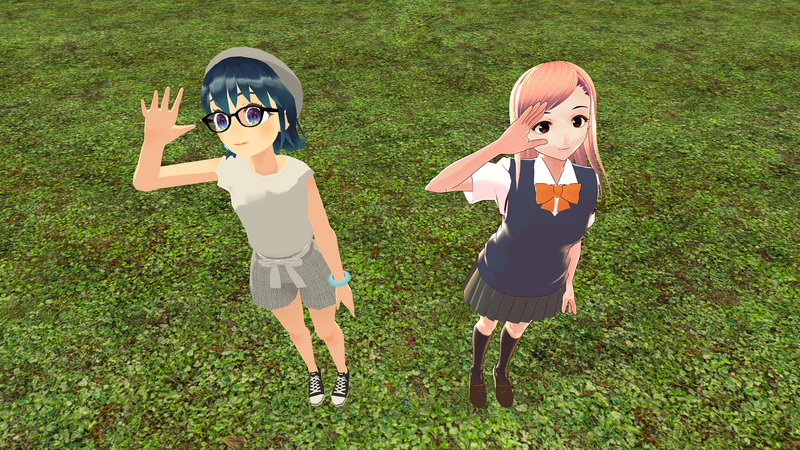 Today, we animated 3D model data of VTubers, and learned how to upload the data to STYLY. By using what we learned today, we can upload any kinds of models, even animals and robots. I hope you upload lots of models and create a sweet VR space.